The Summer Work Travel Program provides students with an opportunity to live and work in the United States during their summer vacation from university to experience and to be exposed to the people and way of life in the United States. Unique opportunity to experience the culture of American people through temporary employment opportunities in the USA. Networking with other students from different countries who will be living and working with you. Full time level 300 university student. Students within an age range of 19 and 27. Completely filled Work and Travel Application forms which can be downloaded from our website www.sytoghana.org or from any of SYTO offices. Original letter of introduction from the University. Note: If it is a bank statement of a business entity, it should be accompanied with form and a Tax clearance Certificate and Business Certificate. Our Partner assists in offering jobs in many states across the US from Maine to Alaska. Many students go to Ohio, Virginia, New Jersey, South Carolina, California to name a few. Students are expected to pay for accommodation and food. Also, please note we offer many jobs for students with employer provided housing, that students pay a weekly amount for often deducted from the paycheck. There are some occasions where students have to find their own housing, but this comes with heavy assistance from the employer and PARTNER. The typical housing cost is anywhere from $80 to $120 dollars per week, depending on the location. Example of a lower amount will be at 30-45$, as well as one at 70$. As far as food, it will depend on the student and again a job may offer some meal plans, but you should budget perhaps 50$USD for food each week. Students must travel with a minimum pocket money of $800. This pocket money pocket money is expected to be used as a start when the student arrives to pay for housing/food/transportation until they begin work, and get paid. DS-2019 Form to support the Application for a J-1Exchange visitor Program visa. Support whilst in the USA. Students will be re-funded with an amount of $1,000 when a participant is refused VISA and & $950 when a student voluntarily withdraws from the program. If a participant is refused visa, it will take between 7-9 months after visa refusal to receive re-fund due to reconciliation processes between SYTO and partner. SYTO GHANA is an official sponsor of the Work and Travel USA programme for participating Ghanaian students. SYTO will therefore provide students with the administrative support services to facilitate the procurement of J-1 VISAS from the US Embassy and also provide all other travel support services with our sister company M&J Travel and Tours. 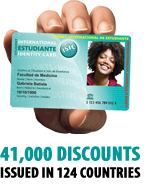 SYTO however will take students through a screening process and make sure that only genuine student who have the interest of returning to their studies after the program and who are genuinely interested to have the experience of travelling in a foreign country are selected to go on the program. 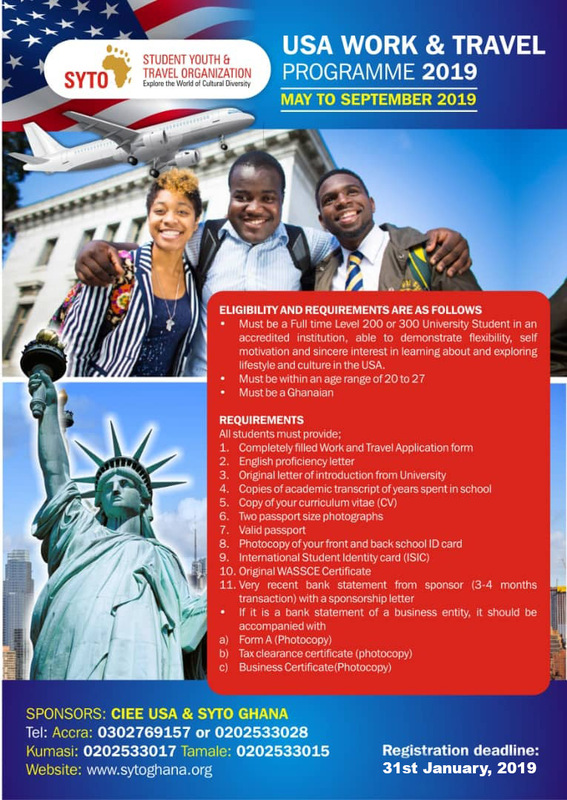 SYTO will procure visa interview dates at the American Embassy in Accra for all students on the program. SYTO will provide protocol services upon request for departure services at the airport. Protocol personnel will be at the airport to facilitate departure from Ghana. The protocol officer will appoint a specific TIME for all students to ARRIVE at the airport. It is important all students adhere to the instructions of the protocol personnel to facilitate departure formalities at the airport.